I always like working with a finite set, whether writing a poem, making a sandwich or packing to return from a vacation. Right now, I’m learning how to write a sestina for my poetry class. Once you have your handful of six end words, the poem becomes a puzzle, and I think of it as writing down the line into the end zone of each end word. Since my mother (yes she’ll still alive though not kicking) features so much in these Snack Attack posts and poetry, I’ll include one stanza from the poem in process. My words are: spoon, chair, room, there, doom, care, and they repeat in the end lines in different order in each of six stanzas. Then all are crammed within a three line “envoi.” If you’re going to embark upon a sestina, a great new tool is a sestin-a-matic that organizes the end words of each stanza for you—whether rhyming, like mine, or a “standard” sestina! Slice the two hardboiled eggs and layer them with sliced avocado into two Damascus pita pockets. Slather some mayo on the “roofs” of the pitas. Sprinkle the eggs and avo and cheese, if you have it, with salt and pepper. Stuff in a little wad of greens—arugula is good. Sprinkle with some EVOO and if you like things spicy, some drops of Sriracha. 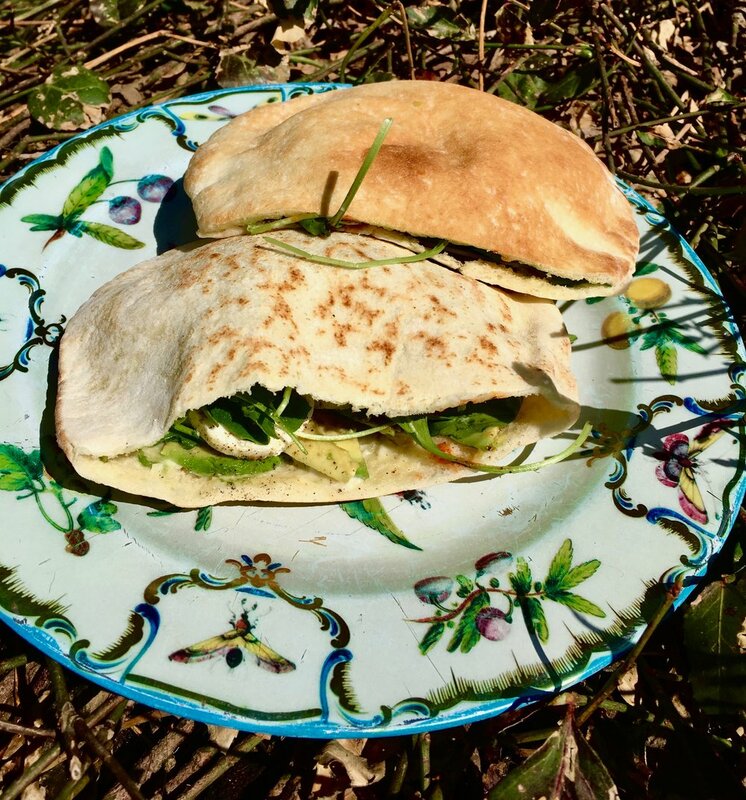 Pack each pita sandwich in foil and put them in your backpack so that the ingredients and flavors meld by the time you eat them. This wasn’t intentional, but I think it works! And there is the finite set of packing to return from a trip. Unlike the anxiety of packing to leave, you just have to get everything in your hotel room or AirbnB into the duffel bag. Again I think of my mother, who we moved from a four-story Virginia house packed to the rafters with her hoarded things. That move took my siblings and I six months, the picking and choosing and sometimes fighting with our mother, who tried to reclaim items that were designated for the dumpster (yes we actually filled one dumpster, maybe two and had a bang-up estate sale). 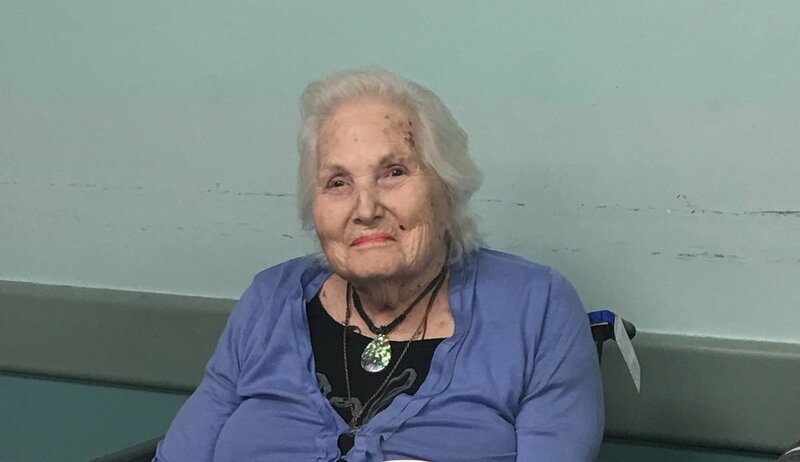 During this last sad phase of her decline, we moved her once again from her sweet Brooklyn apartment to the Cobble Hill nursing home ten blocks away. Again we had to make choices. However, those were mainly which of us siblings would receive paintings, vases or family mementos. Everything my mother needs now fits in one small bedside table with three drawers and one purple bin in her closet. Even my once tall, glamorous mother, has shrunk to fit the confines of her wheelchair. Yet, looking at my mother’s still noble and forbidding profile, her eyes, when they go from glazed to birdlike and alert, her mottled hand stretching out to reach mine, my glibness about the finite set is shot to hell. She is edging toward the infinite and my thoughts about that can’t truly be contained on the page, in a poem or even my own heart.